This weekend there will be another Saturday Night Springfield Special, which is hours and hours of Rick Springfield music. And to any naysayers who are ready with a sarcastic comment: No, that doesn’t mean a continuous loop of “Working Class Dog” and “Success Hasn’t Spoiled Me Yet.” We’re talking hours and hours of RS songs where no song is repeated – five decades worth of music. My first Saturday Night Springfield Special was in December 2014, which was seven hours straight of RS music! It was so cool because there were so many songs I had never heard before – for fans who stopped listening in the 1980s, it’s a great opportunity to discover what RS has done since. In past years, Rowdy Ron also did these shows in honor of RS’s birthday in August, which are fun to listen to not only for the music, but because Rowdy Ron is so funny. He has also done many wonderful interviews with musicians, authors and other special guests on his shows. Thanks to Rowdy Ron for sharing your love of music and for all your entertaining shows! Best of luck on your future endeavors! Ruben Valesco, Rick Springfield’s guitar tech, was diagnosed with Stage 4 cancer in 2014 and is still fighting the battle. A “Rockin for Ruben” benefit concert was held at Hollywood’s House of Blues on the Sunset Strip in August of that year and when I saw him on stage at a concert sometime last year, I hoped he had won the battle. Sadly, it was recently announced that his battle continues. 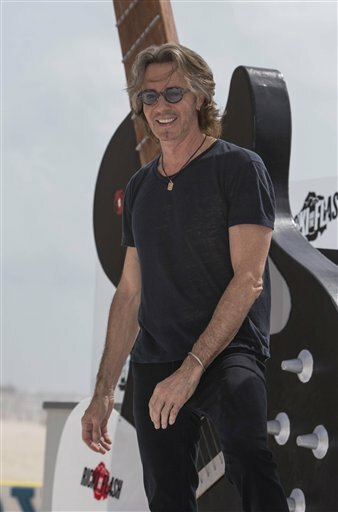 Rick Springfield and team is helping raise funds for Ruben’s medical care via crowdfunding. Find donation information, as well as updates on Ruben, here. But that’s not all. RS’s amazing fans have also planned a fundraiser in support of Ruben. “Still Rockin’ for Ruben,” a raffle planned by We Love Rick Springfield and the Rick and the NEWSflash Facebook Group, will run through July 1. For every $5 in donations, you will receive one raffle ticket number and raffle tickets can also be earned by donating platelets to your local Red Cross. Prizes are being donated by Rick Springfield fans and friends. For a list of prizes and rules, visit the We Love Rick Springfield website. Ruben, wishing you strength to fight this battle and hope to see you at a future show! Sweet Ruben passed today. God Bless his spirit. Farewell my friend. We will miss you and we will all see you on the other side. My condolences to RS, the rest of the band, and all of Ruben’s friends and family. May he rest in peace. According to the Youcaring page, the donations made will be used to help his family pay for medical bills and funeral costs and the fan raffle is now a memorial fund.